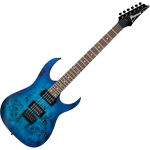 Ibanez RG421PB Electric Guitar in Sapphire Blue Flat [RG421PB SBF] - $399.99 : Online Music Store | The Music Store | Mesa, Arizona, All the music you can handle, delivered to your door! The RG is the most recognizable and distinctive guitar in the Ibanez line. Three decades of metal have forged this high-performance machine, honing it for both speed and strength. This RG421PB model has a gorgeous Poplar Burl top over a mahogany body and a Wizard III neck shape that offers maximum comfort and speed. Its fingerboard is rosewood with 24 jumbo frets for bigger note bends and it also comes with dual Ibanez INF pickups that are wired to a 5-way switch for a variety of coil combinations and sounds. A fixed bridge and Cosmo black hardware complete the list of metal appointments. To ensure safe, on time delivery, The Music Store will ship guitars via UPS only.